12.04.2019 13:05:22 - Stabilizers are chemicals needed for many plastic and rubber products. They enable a safe production and processing; they protect plastics and rubbers against the effects of heat, UV light or oxygen. (live-PR.com) - The market research company Ceresana analyzed the global market for these indispensable additives already for the fourth time. “The revenues generated with stabilizers are likely to reach a volume of USD 5.5 billion until 2025,” Oliver Kutsch, CEO of Ceresana, explains. liquid metal soaps and other products. Lead-based stabilizers are increasingly replaced by calcium- or tin-based products, which leads to a shift of market shares of the particular product categories. Ceresana expects global consumption of calcium-based stabilizers to increase by 3.9% per year. Global demand for tin-based stabilizers is likely to amount about 231,000 tonnes in 2025. Lead-based stabilizers have completely disappeared from the market in the European Union. But also in other regions, increasing demand for more environmentally friendly alternatives is perceivable. In Europe, calcium-based stabilizers are by far the most popular type. In contrast, North America utilizes tin stabilizers most frequently. In total, Asia-Pacific is the largest regional market for stabilizers accounting for a share of 57%, followed by Western and Eastern Europe. Chapter 1 provides a description and analysis of the global stabilizer market, including forecasts up to 2025: For each region of the world, demand in tonnes and revenues in US dollars and euros are given for each region of the world. Furthermore, global and regional demand per product type and application area is analyzed. Tin stabilizers, lead stabilizers, calcium-based stabilizers as well as liquid mixed metal stabilizers and other products are scrutinized. The application areas examined are pipes, profiles, films, wires & cables, flooring, and other applications. 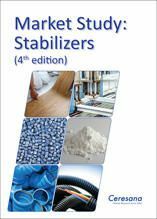 In chapter 2, stabilizer demand, revenues as well as demand split by application areas and split by stabilizer types are analyzed in detail for 16 countries. Additionally, 63 important manufacturers of stabilizers are introduced. Chapter 3 provides profiles of the largest manufacturers of stabilizers, clearly arranged according to contact details, turnover, profit, product range, production sites, profile summary, product types, and application areas. Extensive profiles of the most important manufacturers are given.